Charlebois, Sylvain and Hielm, Sebastian 2014. Empowering the regulators in the development of national performance measurements in food safety. British Food Journal, Vol. 116, Issue. 2, p. 317. Steel, Daniel 2013. The Precautionary Principle and the Dilemma Objection. Ethics, Policy & Environment, Vol. 16, Issue. 3, p. 321. Hartzell-Nichols, Lauren 2013. From ‘the’ Precautionary Principle to Precautionary Principles. Ethics, Policy & Environment, Vol. 16, Issue. 3, p. 308. Weale, Albert 2010. Political Theory and Practical Public Reasoning. Political Studies, Vol. 58, Issue. 2, p. 266. 1 Hahn, Robert W. and Sunstein, Cass R., “The Precautionary Principle as a Basis for Decision Making,” The Economists' Voice 6, no. 2 (2005): 1–9. Hahn is cofounder and executive director of the American Enterprise Institute–Brookings Joint Center for Regulatory Studies. Sunstein is Karl N. Llewellyn Distinguished Service Professor in the Law School and Department of Political Science at the University of Chicago. 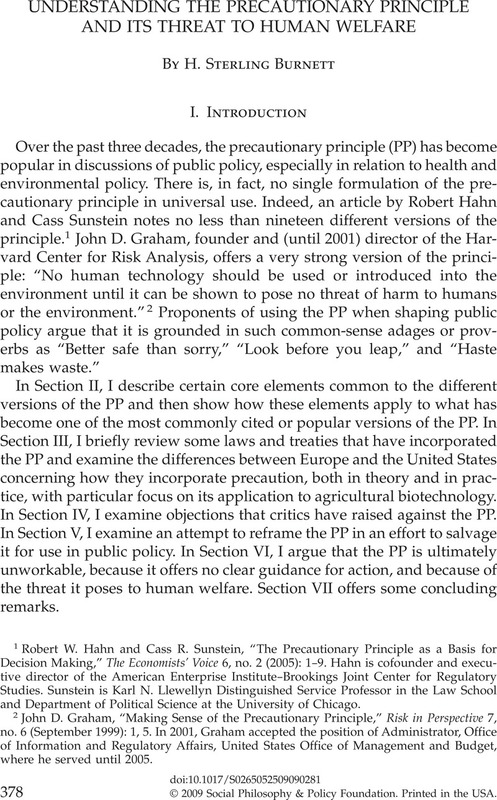 2 Graham, John D., “Making Sense of the Precautionary Principle,” Risk in Perspective 7, no. 6 (September 1999): 1, 5. In 2001, Graham accepted the position of Administrator, Office of Information and Regulatory Affairs, United States Office of Management and Budget, where he served until 2005. 3 See for instance, Morris, Julian, “Defining the Precautionary Principle,” in Morris, Julian, ed., Rethinking Risk and the Precautionary Principle (Oxford: Butterworth-Heinemann, 2000): 1–21; Kaiser, Matthias, “Introduction to the Special Issue on the Precautionary Principle,” Journal of Agricultural and Environmental Ethics 15, no. 1 (2002): 2; and O'Riordan, Tim and Cameron, James, “The History and Contemporary Significance of the Precautionary Principle,” in O'Riordan, and Cameron, , eds., Interpreting the Precautionary Principle (London: Earthscan, 1994), 16. 4 O'Riordan and Cameron, “The History and Contemporary Significance of the Precautionary Principle,” 16–17. 5 Manson, Neil A., “Formulating the Precautionary Principle,” Environmental Ethics 24 (2002): 263–74. Carr, Susan, “Ethical and Value-Based Aspects of the European Commission's Precautionary Principle,” Journal of Agricultural and Environmental Ethics 15, no. 1 (2002): 31–38, also argues for three stages of precaution: the trigger stage; the decision stage; and the application stage. These correspond closely to Manson's tripartite structuring of the PP. 6 Manson, “Formulating the Precautionary Principle,” 265. For the sake of brevity, Manson refers to “e-activities,” “e-effects,” and “e-remedies.” As examples of e-activities, he cites such things as commercial fishing and the commercial release of genetically modified foods. E-effects are outcomes from e-activities, such as the depletion of fish stocks or a severe allergic reaction to a genetically modified organism that has entered the food supply. E-remedies include a range of measures from an outright ban on an activity to further study of the activity and its effects. 8 Julian Morris, director of the Environment and Technology Program at the Institute of Economic Affairs in London, is among those who criticize the use of the vague notion of “irreversibility” that justifies precautionary policies: “[A]ll change (and hence all damage) is irreversible in the strict sense that the precise structure of the world that pertained before cannot once again come into being…. This ultimately negates the utility of including ‘irreversible’ as a criterion distinct from ‘serious.’ ” Julian Morris, “Defining the Precautionary Principle,” in Morris, ed., Rethinking Risk and the Precautionary Principle, 14. 9 Manson, “Formulating the Precautionary Principle,” 269. 10 See the Wingspread Statement on the Precautionary Principle, http://www.sehn.org/wing.html. The 1998 conference was cosponsored by the Science and Environmental Health Network. 11 Morris calls the Wingspread PP the “international standard definition,” noting that an internet search lists literally hundreds of references to it. Morris, “Defining the Precautionary Principle,” 5–6. 12 Wingspread Statement on the Precautionary Principle. See also van den Belt, Henk and Gremmen, Bart, “Between Precautionary Principle and ‘Sound Science’: Distributing the Burdens of Proof,” Journal of Agricultural and Environmental Ethics 15, no. 1 (2002): 103–22; and Lemons, John, Shrader-Frechette, Kristin, and Cranor, Carl, “The Precautionary Principle: Scientific Uncertainty and Type I and Type II Errors,” Foundations of Science 2 (1997): 207–36. As I will discuss in Section III, some precaution has been built into U.S. and European laws, particularly laws concerning medicines and chemicals, for many years. For instance, using scientific risk analysis, prescription drug manufacturers and pesticide manufacturers have had to do extensive testing on the efficacy and safety of their products before their products were allowed onto the market. However, proponents of the PP argue that standard risk analyses are inadequate in the light of scientific uncertainty. Based on this view, they have been successful, in Europe, in placing a much higher burden of proof on the manufacturers of chemicals, pesticides, and medicines, especially in relation to genetically modified organisms or biotech creations. 13 For ease of reference, the precautionary language in this variety of laws and treaties can be found in Adler, Jonathan, “The Precautionary Principle's Challenge to Progress,” in Bailey, Ronald, ed., Global Warming and Other Eco-Myths (Roseville, CA: Prima Lifestyles, 2002), 278–80. Morris also notes the wide adoption of the precautionary principle (“Defining the Precautionary Principle,” 2–7). 14 Adler, “The Precautionary Principle's Challenge to Progress,” 279. 19 For a discussion of this case, see Institute for Agriculture and Trade Policy, “U.S. v. EC Biotech Products Case: WTO Dispute Backgrounder,” http://www.tradeobservatory.org/library.cfm?refid=76644. Though the WTO ruled for the plaintiff countries in 2006, as of 2008, member countries of the European Union have yet to comply with the ruling by removing their bans. See “Europe's Biotech Bans in WTO Firing Line” (February 2006; updated May 2007), http://www.euractiv.com/en/trade/europe-biotech-bans-wto-firing-line/article-152393, and “Commission Hesitant to Approve More GM Crops” (May 8, 2008), http://www.euractiv.com/en/environment/commission-hesitant-approve-gm-crops/article-172209. 20 See, e.g., Journal of Agricultural and Environmental Ethics 15, no. 1 (2002), and Foundations of Science 2 (1997). 21 The description of how the TSCA works in the U.S. is taken from a Government Accountability Office report to the Senate, “Chemical Regulation: Approaches in the United States, Canada, and the European Union,” http://www.gao.gov/new.items/d06217r.pdf. 22 TSCA excludes certain chemical substances, including, among other things, pesticides that are regulated under the 1947 Federal Insecticide, Fungicide, and Rodenticide Act (FIFRA), and food, food additives, drugs, cosmetics, or devices that are regulated under the 1938 Federal Food, Drug, and Cosmetic Act (FFDCA). 24 The European Commission's Environment Web site describes REACH in detail; see http://ec.europa.eu/environment/chemicals/reach/reach_intro.htm. 25 Mutagenicity is the ability and tendency of a chemical or other agent to induce or increase the frequency of mutation in an organism. 26 This discussion is based on material from the United States Regulatory Agencies Unified Biotechnology Web site; see http://usbiotechreg.nbii.gov/index.asp. 27 As amended in 1972, 1988, and 1996. 28 This act has been amended numerous times, most recently in 2007. However, none of the amendments (for registration, regulation, or testing) treat GM foods differently based on their origin (as GM foods as opposed to conventionally modified foods). 29 Pew Initiative on Food and Biotechnology, Application of Biotechnology for Functional Foods (Washington, DC: Pew Initiative on Food and Biotechnology, 2007), 37. Available online at http://www.pewtrusts.org/uploadedFiles/wwwpewtrustsorg/News/Press_Releases/Food_and_Biotechnology/PIFB_Functional_Foods.pdf. 30 The European Commission is the executive branch of the European Union. It is made up of twenty-seven members, one proposed from each member state, who are supposed to represent the interests of Europe as a whole rather than the parochial interests of their home state. The commission has four main roles: to propose legislation to the European Parliament and Council; to administer and implement European Community policies; to enforce Community law; and to negotiate international agreements (mainly those relating to trade and commercial cooperation). See the European Commission Web site, http://ec.europa.eu/index_en.htm. 31 The Biotechnology Policy Group conducts research that relates biotechnology to the broader issues of agriculture, sustainability, regulation, and technological change. Most of the group's projects have focused on the development of genetically modified organisms (GMOs) designed for agricultural uses. For more information, see the Biotechnology Policy Group's Web site, http://technology.open.ac.uk/cts/bpg.htm. 32 Carr, “Ethical and Value-Based Aspects of the European Commission's Precautionary Principle,” 31–38. 33 Ibid., 36–37. Points 2 and 3 seem very similar, and Carr's discussion does not illuminate the precise difference between the two. However, it seems that guideline 2 concerns value judgments regarding whether one technology is comparable to another; if so, then regulatory measures should not discriminate between the two. Guideline 3 concerns the difference in our knowledge about the risks posed by new technologies versus existing technologies. Technologies for which there is less scientific understanding of the risks involved in their introduction or use merit greater scrutiny than technologies within similar policy areas (say, agriculture) for which we have greater understanding of their impact. 34 See Deblonde, Marian and du Jardin, Patrick, “Deepening a Precautionary European Policy,” Journal of Agricultural and Environmental Ethics 15, no. 1 (2002): 319–43. The article's authors laud the increasing stringency of European precautionary regulatory policies and, indeed, argue for the need to make laws and regulations even more restrictive. 35 “Europe's Biotech Bans in WTO Firing Line” (see note 19 above). 37 The European Food Safety Authority is a body of scientists established in 2002 and mandated to conduct a scientific assessment of GM foods and to report their findings to the EC. 38 Some may say that I am being too hard on the EC. After all, it has approved some GM products, and how can it be blamed if member states won't follow its directives? But this misses the point. The EC has the authority to penalize member countries that violate its rulings on commercial matters, and it has failed to do so. The EC has ordered countries to allow, at a minimum, the GM crops it has approved and to follow the WTO ruling, but none of the eight countries with national bans has lifted them, nor have they or the EU as a whole followed the WTO's ruling and modified their approval procedures for GM crops. 39 Kaiser, Matthias, “Introduction to the Special Issue on the Precautionary Principle,” Journal of Agricultural and Environmental Ethics 15, no. 1 (2002): 1–5. 40 Manson, “Formulating the Precautionary Principle,” 270. U.S. federal judge and noted legal scholar Richard Posner has written a book concerning the need for governments to take precautionary actions in response to the threat posed by extremely unlikely but possible catastrophes: Posner, Richard, Catastrophe: Risk and Response (Oxford: Oxford University Press, 2004). Unlike proponents of the PP, however, Posner extends his argument for precautionary policies to natural as well as human-induced potential catastrophes. 41 Pascal, Blaise, Pensées, trans. Turnell, Martin (London: Harvill Press, 1962), 202–3. Numerous scholars have noted the similarity in reasoning between the catastrophe or disaster arguments for a strong PP and Pascal's famous wager. See, for instance, van den Belt, Henk, “Debating the Precautionary Principle: ‘Guilty until Proven Innocent’ or ‘Innocent until Proven Guilty’?” Plant Physiology 132 (2003): 1122–26; Manson, “Formulating the Precautionary Principle,” 272; and Morris, Julian, “Defining the Precautionary Principle,” in Morris, Julian, ed., Rethinking Risk and the Precautionary Principle (Oxford: Butterworth-Heinemann, 2000), 7. 42 Haller, Stephen, “A Prudential Argument for Precaution under Uncertainty and High Risk,” Ethics and the Environment 5, no. 2 (2000): 175–89. 44 Burnett, H. Sterling, “Progress at Risk: Using the Precautionary Principle as a Standard for Regulatory Policy,” in Jones, Laura, ed., Safe Enough? Managing Risk and Regulation (Vancouver: The Fraser Institute, 2000), 155–64. 45 Van den Belt is Assistant Professor with the Applied Philosophy Group, and Gremmen is Professor of Ethical and Societal Aspects of Genomics at the Center for Society and Genomics, both at Wageningen University in the Netherlands. Van den Belt and Gremmen, “Between Precautionary Principle and ‘Sound Science’,” 107. Van den Belt and Gremmen note others who have made the same point: for instance, Aaron Wildavsky observed that the only way to prove a negative is an impossibility theorem demonstrating that the contemplated action is contrary to the laws of nature. Aynsley Kellow made the point more graphically: “Demanding that a negative be proved is the logical equivalent of asking people to prove that they are not witches.” See Wildavsky, Aaron, But Is It True? A Citizen's Guide to Environmental Health and Safety Issues (Cambridge, MA: Harvard University Press, 1995); and Kellow, Aynsley, “Risk Assessment and Decision-Making for Genetically Modified Foods,” IPA Policy Backgrounder, Melbourne: Institute for Public Affairs, 1999. 46 Ames, Bruce N. and Gold, Lois Swirsky, Misconceptions about Environmental Pollution, Pesticides, and the Causes of Cancer (Dallas: National Center for Policy Analysis, Policy Report No. 214, 1998). The study can be found online at http://www.ncpa.org/studies/s214.html. 49 Commoner is a biologist and, in 1980, was the U.S. presidential candidate of the Citizens Party. Commoner, Barry, The Closing Circle: Nature, Man, and Technology (New York: Alfred A. Knopf, 1971). For an excerpt from Commoner's book setting out his four laws of ecology, see http://www3.niu.edu/~td0raf1/history261/nov1910.htm. 52 Wildavsky, Aaron, Searching for Safety (New Brunswick, NJ: Transaction Books, 1988). 54 Avery, Dennis, “Biotechnology: Trade Crisis or Path to Future?” Global Food Quarterly, Summer 1999, pp. 1, 3; see also Avery, Dennis, Saving the Planet with Pesticides and Plastic: The Environmental Triumph of High Yield Farming (Indianapolis: Hudson Institute, 2000), 33. 55 Moore, Patrick, “How to Fight Childhood Blindness,” The American: A Magazine of Ideas (October 12, 2007), http://www.american.com/archive/2007/october-10-07/how-to-fight-childhood-blindness. Population estimates are from the United Nations, http://esa.un.org/unpp/p2k0data.asp. 59 Global Status of Commercialized Biotech/GM Crops: 2007, International Service for the Acquisition of Agri-Biotech Applications, ISAAA Brief 37 (2007), http://www.isaaa.org/resources/publications/briefs/37/executivesummary/default.html. 61 See “Working Principles for Risk Analysis for Food Safety for Application by Governments,” http://www.codexalimentarius.net/web/more_info.jsp?id_sta=10751. 62 Henry I. Miller and Gregory Conko, “Genetically Modified Fear and the International Regulation of Biotechnology,” in Morris, ed., Rethinking Risk and the Precautionary Principle, 84–104. 63 Avery, “Biotechnology,” 1, 3. 64 One report discusses more than 150 government and industry-financed studies: Committee on Identifying and Assessing Unintended Effects of Genetically Engineered Foods on Human Health, Safety of Genetically Engineered Foods: Approaches to Assessing Unintended Health Effects (Washington, DC: The National Academies Press, 2004). Another report discusses more than forty-seven peer-reviewed articles published in scientific journals: Christopher Preston, “Peer Reviewed Publications on the Safety of GM Foods,” http://www.agbioworld.org/biotech-info/articles/biotech-art/peer-reviewed-pubs.html. The studies reviewed have found little or no evidence of harm from GM foods. 65 The fear is that weeds or insects targeted by GM crops (crops that have been modified, for instance, with resistance to a particular pesticide) will either be cross-hybridized (in the case of the plants) or evolve immunity not only to the pesticide contained in the GM plant but to other pesticides as well. 66 Myhr, Anne Ingeborg and Traavik, Terje, “The Precautionary Principle: Scientific Uncertainty and Omitted Research in the Context of GMO Use and Release,” Journal of Agricultural and Environmental Ethics 15, no. 1 (2002): 73–86; Mayer, Sue and Stirling, Andy, “Finding a Precautionary Approach to Technological Developments—Lessons for the Evaluation of GM Crops,” Journal of Agricultural and Environmental Ethics 15, no. 1 (2002): 57–71. 67 Bacillus thuringiensis was later proved so successful in corn that it was tested in other plants, where it proved to be effective in controlling other insects as well. 68 Milius, Susan, “New Studies Clarify Monarch Worries,” Science News 156 (December 18 and 25, 1999): 391. 69 Ritter, Jim, “Genetic Food Fallout,” Associated Press Wire, February 28, 2000. 70 Milloy, Steven J., “The Greens' Ear-ie Ad,” Washington Times, December 10, 1999: 21. 71 Milius, “New Studies Clarify Monarch Worries,” 391. 72 Global Status of Commercialized Biotech/GM Crops: 2007 (see note 59 above). 73 Nordlee, Julie A., Taylor, Steve L., Townsend, Jeffrey A., Thomas, Laurie A., and Bush, Robert K., “Identification of a Brazil-Nut Allergen in Transgenic Soybeans,” New England Journal of Medicine 334, no. 11 (March 14, 1996): 688–92. 74 Miller, Henry I. and Conko, Gregory, “The Toxic Politics of Biotech,” Tech Central Station, October 6, 2004, http://cei.org/gencon/019%2C04249.cfm. Miller was founding director of the U.S. Food and Drug Administration's Office of Biotechnology in 1989 and is currently a senior research fellow at Stanford University's Hoover Institution. Conko is director of Food Safety Policy at the Competitive Enterprise Institute. 75 McHughen, Alan, Biotechnology and Food (New York: American Council on Science and Health, 2000). 76 Associated Press, “Study Says Bio-engineered Foods Safe, But More Tests, Monitoring Urged,” Dallas Morning News, April 6, 2000: 5A. 78 Jenkins, Holman W. Jr., “Fun Facts to Know and Tell about Biotechnology,” Wall Street Journal, November 17, 1999: A23. 79 Goklany, Indur M., The Precautionary Principle: A Critical Appraisal of Environmental Risk Assessment (Washington, DC: Cato Institute, 2001). Unless otherwise noted, the material in this section comes from this book. 80 I would add that, in a liberal polity in which one of the primary responsibilities of government is respecting and protecting individuals' liberty and rights, this criterion should be expanded to threats to individual rights. Goklany does not extend his principles in this manner, perhaps because his views are founded not on a rights-based liberalism, but rather on a liberalism based on utilitarian calculations. Based on e-mail exchanges, Goklany's view seems to be that individual liberty has no (or at best limited) independent value apart from its tendency to generally promote well-being, defined as macroeconomic progress; beyond the ethical criteria, policies are worth enacting, or at least worth serious consideration, if they promote overall net social benefits. 81 Ibid., 9–10. All further criteria are also found on page 10. 82 Organization, World Health, Malnutrition Worldwide (1999), http://www.who.int/nut/malnutrition_worldwide.htm. 83 Land use numbers come from the Food and Agriculture Organization, FAOSTAT Database, http://www.apps.fao.org (2001). Water use numbers come from Shiklomanov, Igor A., “Appraisal and Assessment of World Water Resources,” Water International 25, no. 1 (March 2000): 11–32. “Consumptive use” means withdrawing water from its source for human uses—for example, water used for drinking, cleaning persons or property, or irrigation. Nonconsumptive use would include recreational or commercial fishing, for example. 84 See, for example, Goklany, The Precautionary Principle, 29–56. 85 Hahn and Sunstein, “The Precautionary Principle as a Basis for Decision Making”; Marchant, Gary, “From General Policy to Legal Rule: Aspirations and Limitations of the Precautionary Principle,” Environmental Health Perspectives 111, no. 14 (2003). Marchant is a law professor with Center for the Study of Law, Science, and Technology at Arizona State University. 86 On the PP as a recipe for policy paralysis, Hahn and Sunstein write: “A key problem with strong versions of the precautionary principle is that they are logically inconsistent. They would frequently eliminate all policies from consideration—including the status quo—because almost all policies impose risks of one kind or another.” Hahn and Sunstein, “The Precautionary Principle as a Basis for Decision Making,” 2. On the ambiguity and arbitrariness of the PP, see Marchant, “From General Policy to Legal Rule,” 1800–1801. 87 Marchant, “From General Policy to Legal Rule,” 1802–3. 88 See, e.g., Westra, Laura, “Post-Normal Science, the Precautionary Principle, and the Ethics of Integrity,” Foundations of Science 2 (1997): 237–62; Alroe, Hugo Fjelsted and Kristensen, Erik Steen, “Toward a Systemic Ethic: In Search of an Ethical Basis for Sustainability and Precaution,” Environmental Ethics 25 (Spring 2003): 59–78; and Attfield, Robin, “The Precautionary Principle and Moral Values,” in O'Riordan, and Cameron, , eds., Interpreting the Precautionary Principle, 152–64. 89 Brown-Weiss, Edith, In Fairness to Future Generations: International Law, Common Patrimony, and Intergenerational Equity (New York: Transaction Publishers, 1989); see also Haller, “A Prudential Argument for Precaution under Uncertainty and High Risk.” See also Partridge, Ernest, ed., Responsibilities to Future Generations (New York: Prometheus Books, 1981), for numerous arguments both for and against the notion that present generations have obligations to future generations. Some of these arguments are tied to the precautionary principle, as noted in Wilfred Beckerman, “The Precautionary Principle and Our Obligation to Future Generations,” in Morris, ed., Rethinking Risk and the Precautionary Principle, 46–59. 90 Burnett, “Progress at Risk” (supra note 44). 91 Social Issues Research Center, “Beware the Precautionary Principle,” 1999, http://www.sirc.org/articles/beware.html. 92 Marchant, “From General Policy to Legal Rule,” 1799. 94 Marchant makes this same point, arguing that it is inherently more difficult to verify false positives (what I refer to as “type I errors”) than false negatives. See ibid., 1800. 96 See, for example, Trewavas, Anthony J., “Urban Myths of Organic Farming,” Nature 410 (March 22, 2001): 409–10; or Tierney, John, “Is Food Safe Just Because It's Organic?” New York Times, August 25, 2000: B1. 97 Marchant, “From General Policy to Legal Rule,” 1802. 99 Some critics argue that present law already contains too much precaution, resulting in unnecessary harms. For them, rather than adopting the PP as an explicit basis for future laws and regulations, many of the present precautionary aspects of the law should be reduced or eliminated. See, for instance, Adler's discussion of the drug approval process and restrictions on the use of DDT, in Adler, “The Precautionary Principle's Challenge to Progress,” 285–88. Though I share that view, that is a case to be made at another time in another essay.